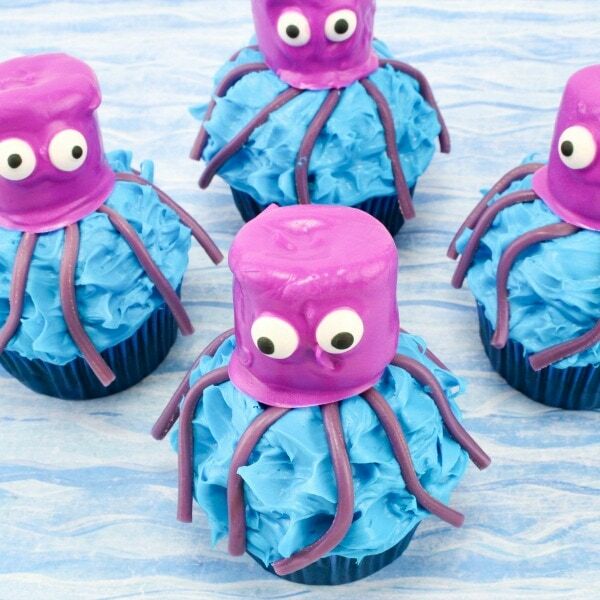 Octopus Cupcakes are adorable for summer themed parties! This ocean themed treat will be a big hit with any group of kids! Parents will love how easy these cute decorated cupcakes are to make! My daughter's school theme this year under the sea and these treats will be a big hit in her classroom. I like QUICK and easy treats so I make these cupcakes with prepared cupcakes I bought at the store. 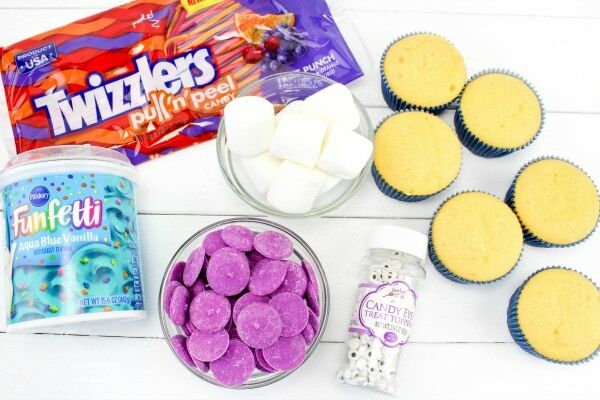 If you want to make your own cupcakes that works great too! These cupcakes don't take long to make. This recipe makes 6 cupcakes so feel free to double, triple or quadruple–depending on how many you need for your group of kids. Start off by melting the purple candy melts in the microwave according to the package directions. If you are only making 6 cupcakes you won't need the whole bag. I like to melt some and then can melt more if needed. Spread some parchment paper out on the counter. Stick a toothpick into one end of a large marshmallow. Cover the marshmallow in the melted purple chocolate until it is completely covered. Sit it down on the parchment paper to harden and remove the toothpick. Place 2 edible candy eyes on the side of the marshmallow before the chocolate hardens. Repeat this process for all the marshmallows. While the marshmallows are hardening go ahead and frost the cupcakes with the blue frosting. Add some extra frosting to the middle so it slopes down some. Use a knife to touch the frosting and pull up on it so that it resembles waves. Take a rope of the Twizzlers Pull N' Peel licorice and cut it into four pieces. Unwind all of the licorice strings so that all the purple strands are separate. It takes 48 pieces to make the 6 cupcakes! Put 8 of the licorice pieces on the cupcake so that they drape down a little bit. Place one of the purple marshmallow “heads” in the center of the cupcake covering the legs so it looks attached to the legs. Push the marshmallow down so it is firmly on the cupcake and won't topple off! 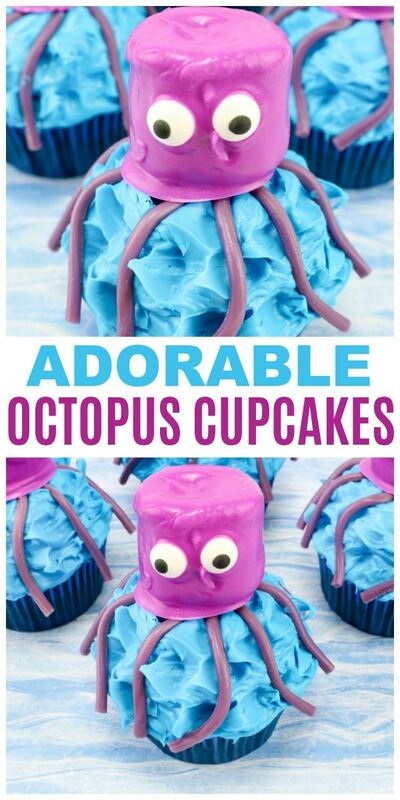 I know you are excited to make these adorable sea themed Octopus cupcakes. You can download the full ingredient list and instructions for the recipe on the recipe card below. 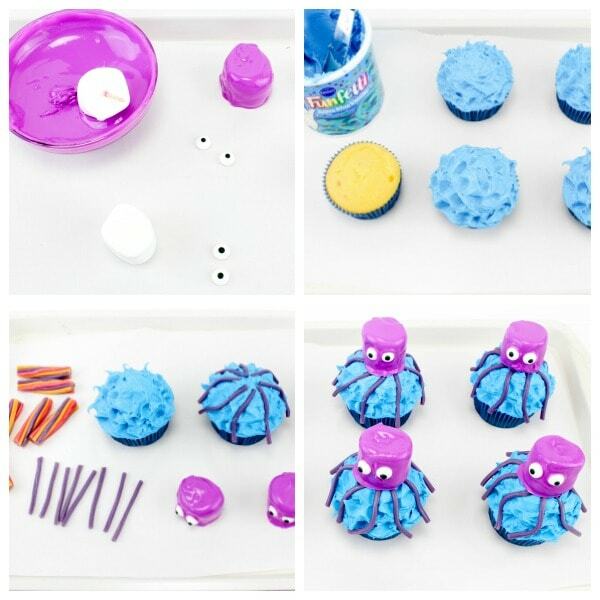 These Octopus Cupcakes are perfect for any ocean themed party for school or birthdays. Quick to make and adorable! In a small bowl, melt the chocolate per package directions. Poke a toothpick into a marshmallow and dip into the chocolate until fully covered. Set the marshmallow down on a parchment lined baking sheet and remove the toothpick. Repeat this for all the marshmallows. Press 2 eyeballs on the front of each marshmallow before the chocolate hardens. Leave these set until the chocolate is hard. Frost each cupcake with the blue frosting making sure to put extra in the middle so the frosting slopes downward a little. Take a knife, touch it all around the frosting, and gently pull up so the frosting will look like water waves. Take a rope of the licorice and cut into 4 pieces. Unwind the strings so you will have all the purple pieces separated. You will need 48 of these pieces for the octopus legs. Lay 8 licorice legs over the top of each cupcake so they drape down over the frosting hanging off the edges a bit. 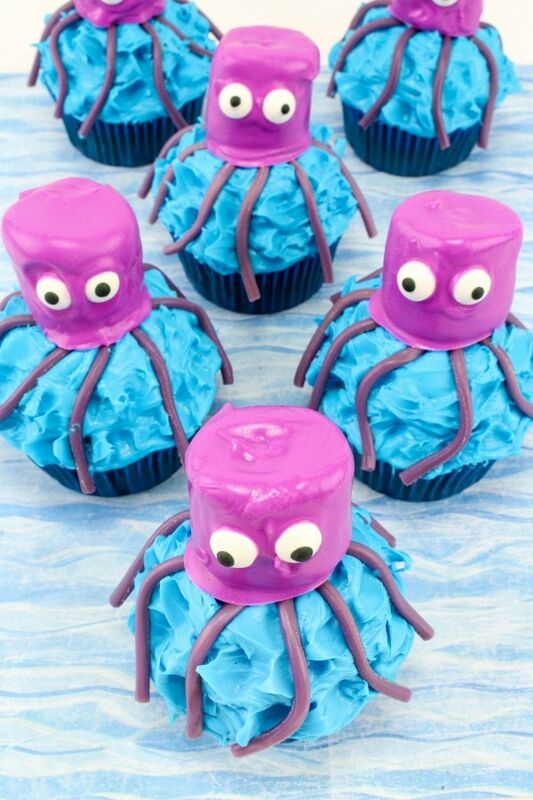 Set an octopus head on top of each cupcake right in the center over the tops of the legs. Press them down a bit so they stay on the cupcake and so it looks like the head is attached to the legs. 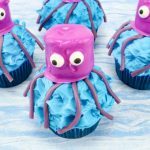 Don't forget to PIN this recipe for Octopus Cupcakes so you can make them every summer!